This week as I drove through Chicago, parts of the North Shore, Oak Park & River Forest, I was amazed at how much low-quality restoration work was being performed by folks passing themselves off as "masons." In most cities and suburbs in Cook and Lake Counties, individuals do not need to be licensed in the sense that they have been certified as "competent" or "expert" in the trade. Often, these people need only submit proof of insurance and pay a modest fee for a business license to be able to claim they are qualified to perform what is, in effect, surgery on your brick home or building. That's unsettling. Recently I drove by a service vehicle which caught my eye (see below). A few things I have learned about this industry in my 20 years running the family business and this photo seemed to capture them. 1. A fancy truck does not a restorationist make. Lots of new trucks are purchased by folks looking to make a nice first impression. Many of these trucks are re-possessed a year later because the skill set of the mason driving the car falls far short of expectations. 2. 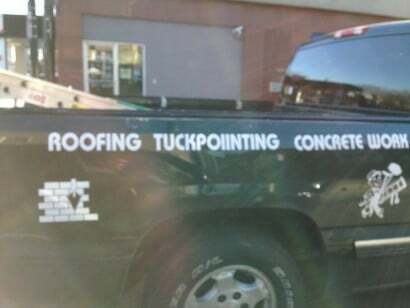 If the tradesman cannot spell his trade properly (or does not catch the misspelling of his trade on the side of his fancy new truck), then he's probably going to miss some details on your project...or worse. 3. Tradesman should focus on one trade only. We've seen concrete driveway repairmen pass themselves off as masonry restorationists. We've seen roofers try to pass themselves off as masonry restorationists. Heck, we've even seen painters try to pass themselves off as masonry restorationists — what does a paintbrush have in common with a trowel? Tradesmen should focus on one trade and one trade only. For 60 years we've been focused solely on masonry restoration work (grinding & tuckpointing mortar joints, restoring bricks and lintels, washing, caulking and sealing masonry). Every one of the foremen at this company has been in the field performing masonry restoration work (and only masonry restoration work) for 28 years or longer. We do not roof, we do not pour concrete driveways, and we sure do not paint homes. If you have a masonry issue, we would like to help. Call us at the office or click here to leave an e-mail for Carolina, our terrific office manager, who will route your question or request for a proposal to one our veteran licensed project managers.